The Tibetan people are indigenous to Tibet and surrounding areas stretching from Central Asia in the North and West to Myanmar and China Proper in the East. Recent genetic studies indicate that the ancestors of the Tibetan people diverged from the ancestors of the Han Chinese about 5,000–6,000 years ago, and migrated south and west into the Himalayas, mingling with another population group from Central Asia before spreading over Tibet. Spoken Tibetan, typically classified as a Tibeto-Burman language, has three major local dialects: Central Tibetan, Kang and Amdo. The classical written form of the Tibetan language, created early in the seventh century, is a major regional literary language, used particularly in Buddhist literature. Until the twentieth century, the Tibetan people were primarily farmers and pastoral nomads, with a clearly delineated peasantry and elite landowning class. The harsh conditions under which they lived engendered a reliance on a greater power, and a deep respect for spiritual values which is still evident in their lifestyle today. Most Tibetans observe Tibetan Buddhism and a collection of native traditions known as Bön (also absorbed into mainstream Tibetan Buddhism). Tibetan lamas, both Buddhist and Bön, play a major role in the lives of the Tibetan people, conducting religious ceremonies and taking care of the monasteries. 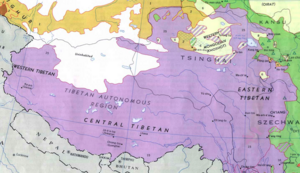 Tibet was forcibly incorporated into the People's Republic of China (PRC) in 1950. The Tibetans are one of the largest of 56 nationalities officially recognized by China to constitute the Zhonghua Minzu or Chinese nation, although in anthropological terms, they could be regarded as comprising more than one ethnic group. 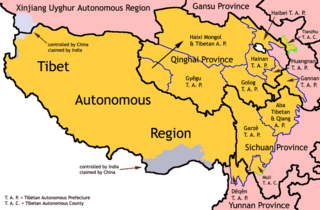 Ethnic Tibetan autonomous entities set up by the People's Republic of China. According to the Chinese census conducted in 2000, there are 2,616,300 people in Tibet, with Tibetans totaling 2,411,100 or 92.2 percent of the current regional population. The SIL Ethnologue documents an additional 125,000 speakers of Tibetan living in India, 60,000 in Nepal, and 4,000 in Bhutan. The Government of Tibet in Exile claims that the number of Tibetans has fallen from 6.3 million to 5.4 million since 1959,  while the government of the People's Republic of China claims that the number of Tibetans has risen from 2.7 million to 5.4 million since 1954. The SIL Ethnologue documents an additional 125,000 Tibetan exiles living in India, 60,000 in Nepal, and 4,000 in Bhutan. Tibetan exile groups estimate the death toll in Tibet since the invasion of the People's Liberation Army in 1950 to be 1.2 million. Official records provided by the Chinese government indicate a blossoming of ethnic Tibetan population from 1.2 million in 1952, to 2.6 million by the end of 2000; much of this is attributed to the improved quality of health and lifestyle of the average Tibetan since the beginning of reforms under the Chinese governance resulting in an infant mortality rate of 35.3 per 1,000 in the year 2000, as compared to the 430 infant deaths per 1,000 in 1951 and an average life expectancy of 35 years in 1950s to over 65 years for the average Tibetan in the 2000s. It is generally agreed that Tibetans share a considerable genetic background with Mongols, although other primary influences exist. Some anthropologists have suggested an Indo-Scythian component, and others a Southeast Asian component; both are credible given Tibet's geographic location. A recent genetic study of Tibetan Y-chromosomes suggests that about 5,000–6,000 years ago, a subgroup of the Proto-Sino-Tibetan people, who had settled in the Yellow River valley, diverged from the ancestors of the Han Chinese and migrated, probably following the “Zang (Tibet)-Mien corridor,” from the upper Yellow River region westward to Qinghai province and then southward to the Himalayas. This subgroup, called the Proto-Tibeto-Burman people, crossed the Himalayan mountains, and reached the southern Himalayan area, peopling Bhutan, Nepal, northeastern India, and northern Yunnan. After mingling with another population group, possibly from central Asia, some of them entered the Himalayas and eventually expanded all across Tibet. This theory is supported by archaeological and linguistic evidence. The Tibetan language is a member of the Tibeto-Burman branch of the Sino-Tibetan language family. Tibetans traditionally explain their own origins as rooted in the marriage of of the bodhisattva Chenrezig and a mountain ogress. Tibetans who display compassion, moderation, intelligence, and wisdom are said to take after their fathers, while Tibetans who are "red-faced, fond of sinful pursuits, and very stubborn" are said to take after their mothers. Tibetan (“bod-yig,” Tibetan language) is typically classified as a Tibeto-Burman language. Spoken Tibetan includes dozens of regional dialects and sub-dialects which, in many cases, are not mutually intelligible. According to geographical divisions, it has three major local dialects: Central Tibetan, Kang and Amdo. Several forms of Tibetan are also spoken by various peoples of northern Pakistan and India in areas like Baltistan and Ladakh, which are both in or around Kashmir. The Tibetan language is highly stylized and reflects the traditional social hierarchy of a peasantry and an elite. For most terms, there is an honorific expression used when speaking to equals or superiors, and an ordinary word used when addressing inferiors or referring to oneself. An additional set of higher honorifics is used when addressing the highest lamas and nobles. The classical written form of the Tibetan language is a major regional literary language, used particularly in Buddhist literature. In the early seventh century, the Tibetan language, a phonetic system of writing was created based on the writing system of the ancient Sanskrit language of India. Tibetan language consists of thirty consonant, four vowels, five inverted letters (for rendering foreign words) and the punctuations. Sentences are written from right to the left. Two major written scripts, the regular script and the cursive hand, are widely used in all areas inhabited by Tibetans. From the tenth to the sixteenth centuries, Tibetan literary culture developed dramatically. Literary works include two well-known Buddhist classics, the Bka-gyur, and the Bstan-gyur, and works on cadences, literature, philosophy, history, geography, mathematics, the calendar, and medicine. Traditional Tibetan society was agricultural and divided into an elite and a peasant class, with most farmers working as tenants or hired laborers on land owned by the monasteries or the nobility. Farmers lived in small villages. Nomadic herdsmen and shepherds pastured their flocks of yak and sheep on the high steppes; some of them spent winters in the lowlands and migrated to the highlands in summer. Prior to the Chinese annexation of Tibet in 1959, it was estimated that about one-quarter of the population belonged to the clerical order. Monasteries were the main seats of learning and offered an alternative to education in secular schools. Urbanization and industrialization, and disruption of the traditional political order, have increased social mobility. Tibetans in cities, who previously made a living as craftsmen, are migrating into factories and businesses. Most marriages are monogamous, but polyandry and polygyny are practiced in some parts of Tibet: A woman may simultaneously be married to her husband and his brother or father, or a man may be married both to his wife and her sister or widowed mother. This is usually done to keep a family estate intact and provide financial security. Marriages are sometimes arranged by the parents, if the son or daughter has not selected his or her own partner by a certain age. Since the late nineteenth century, the Chinese presence in Eastern Tibet has increased; however mixed marriages between Tibetans and Chinese are still not very common. The Tibetan people are divided into several groups. These include the Changri, Nachan, and Hor, who are further divided into fifty-one sub-tribes, each of them maintaining a distinct yet related cultural identity. The Tibetans living in Kham are of Qiang descent and speak a Qiangic language, although they are not officially classified as part of the Qiang minority. The Hor, who are further sub-divided into thirty-nine sub-tribes, are of Mongolian descent. 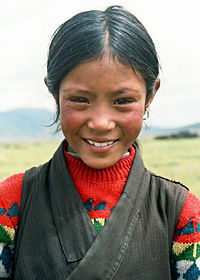 The Tibetans in Kham are also known as the Khampa, while those in the far west and north are known as Poiba. Descendants of the Karjia are known as the Ando. Although the Tangut are now extinct as a distinct people, their descendants can be found among the Tibetans and Salar of Gansu. The Monpa (Tibetan: མོན་པ།), also known as Menba, Moinba, Monba, Menpa, or Mongba are an ethnic group in the Indian territory of Arunachal Pradesh, with a population of 50,000, centered in the districts of Tawang and West Kameng. Another 25,000 of them can be found in the district of Cuona in Tibet, where they are known as Menba (Simplified Chinese: 门巴族; Traditional Chinese: 門巴族; pinyin: Ménbà zú). They speak Monpa and Tibetan. The Monpa practice slash-and-burn agriculture, and rely heavily on hunting. Game is distributed among all the residents of a village, with a double portion for the hunter. Game is also bartered for grain and other necessities. The Monpa are generally adherents of the Gelugpa sect of Tibetan Buddhism, which they adopted in the seventeenth century as a result of the evangelical influence of the Bhutanese-educated Mera Lama. Some elements of the pre-Buddhist Bön faith have remained strong among the Monpas, particularly in regions nearer to the Assamese plains. In every household, small Buddhist altars placed with statues of Buddha are given water offerings in little cups and burning butter lamps. The Monpa are known for wood carving, Thangka painting, carpet making and weaving. They manufacture paper from the pulp of the local sukso tree. A printing press can be found in the Tawang monastery, where many religious books are printed on local paper with wooden blocks, usually for literate Monpa Lamas, who use them for religious rituals. The Lhoba (珞巴) is currently an officially recognized ethnic group in China. They are divided between the Yidu (Idu), which is classified as one of the three sub-tribes of the Mishmi, and the Boga'er (Bokar), a sub-tribe of the Adi. Both groups, also found in the Indian state of Arunachal Pradesh, collectively form a population of around 10,500. The term "Lhoba," however, is only limited to these groups living on the Chinese side of the Indo-Chinese border. The Lhoba live in southeastern Tibet, notably in Mainling, Medog, Lhunze and Nangxian counties of Nyingchi Prefecture in southeastern Tibet. Additionally, a small number live in Luoyu, southern Tibet. Many more live in south of the Tibetan border in Dibang Valley in Arunachal Pradesh, where they engage in traditional agriculture and hunting. They engage in barter trade, exchanging goods like animal hides, musk, bear paws, dye and captured game for farm tools, salt, wool, clothing, grain, and tea from Tibetan traders. Few Lhoba know the Tibetan language. In the past, when there was no writing, the Lhobas maintained an oral history supported by coded knots tied in special cords that were kept as records. Their literature is a significant influence on that of their Tibetan counterparts. Many Lhobas have converted to Tibetan Buddhism in recent years, frequently mixing it with their indigenous animist beliefs. The Sherpa (Tibetan:ཤར་པ, "eastern people," from shar "east" + pa "people") migrated from eastern Tibet to Nepal within the last 500 years. Most Sherpas live in the eastern regions; however, some live farther west in the Rolwaling valley and in the Helambu region north of Kathmandu. Pangboche is the Sherpas' oldest village in Nepal. Sherpas speak their own Sherpa language which in many ways resembles a dialect of Tibetan. Traditionally, Sherpas grew potatoes and raised yak for dairy products, hides, wool and carrying loads. Today their major occupations are tourism, trade, and farming. Sherpas wear white jackets. Women wear a skirt over trousers, and men wear short trousers with a belt and hunting knife. Sherpas are Buddhist. The Dengba people, also known as the Deng, lived in Tibet's Zayu county and the virgin forest areas between the Himalayas and the Hengduan Mountains at an elevation of 1,000 meters. More recently they have moved into terraced river valleys with the assistance of the government. Approximately 10,000 Dengba live in Tibet. Traditionally, the Dengba cultivated farmland using scythes, controlling weeds by burning. They build two-story structures, with the family living above and livestock housed below. Deng women commonly wear long, drum-like silver earrings, a headdress covering the forehead, and around the neck a string of beads or silver jewelry. They wear silk skirts and go barefooted. Men wear a black cloth wound about their heads and silver earrings. Although they have no written language, the Deng people have their own spoken language, which derives from the Tibetan-Myanmese branch of the Chinese-Tibetan language family. They had an oral history, supported by rope cut into different lengths to record events. The Dengba have rejected conversion to Buddhism, but many of them outwardly observe Buddhist rituals. A Tibetan girl in Aba, Sichuan Province, China. Tibetans have a legendary ability to survive extremes of altitude and cold, an ability conditioned by the extreme environment of the Tibetan plateau. Recently, scientists have sought to isolate the cultural and genetic factors behind this adaptability. Among their findings was a gene which improves oxygen saturation in hemoglobin and the fact that Tibetan children grow faster than other children to the age of five (presumably as a defense against heat loss since larger bodies have a more favorable volume to surface ratio). The Tibet Paleolithic Project is studying the Stone Age colonization of the plateau, hoping to gain insight into human adaptability in general and the cultural strategies the Tibetans developed as they learned to survive in this harsh environment. The ability of Tibetans to function normally in the oxygen-deficient atmosphere at high altitudes—frequently above 4,400 meters (14,000 ft), has often puzzled observers. Recent research shows that, although Tibetans living at high altitudes have no more oxygen in their blood than other people, they have 10 times more nitric oxide (NO) and double the forearm blood flow of low-altitude dwellers. Nitric oxide causes dilation of blood vessels allowing blood to flow more freely to the extremities and aids the release of oxygen to tissues. This may also help explain the typical rosy cheeks of high-altitude dwellers. It is not yet known whether the high levels of nitric oxide are due to a genetic trait or whether people from lower altitudes would gradually adapt in the same way after living for prolonged periods at high altitudes. Most Tibetans generally observe Tibetan Buddhism and a collection of native traditions known as Bön (also absorbed into mainstream Tibetan Buddhism). Legend says that the 28th king of Tibet, Lhatotori Nyentsen, dreamed of a sacred treasure falling from heaven, which contained a Buddhist sutra, mantras, and religious objects. However, because the modern Tibetan script was not introduced to the people, no one knew what was written in the sutra. Buddhism did not take root in Tibet until the reign of Songtsen Gampo (c. 605–649), who married two Buddhist princesses, Brikhuti and Wencheng. It gained popularity when Padmasambhava, widely known as Guru Rinpoche, visited Tibet in the eighth century at the invitation of the 38th Tibetan king, Trisong Deutson. Tibetan lamas, both Buddhist and Bön, play a major role in the lives of the Tibetan people, conducting religious ceremonies and taking care of the monasteries. Pilgrims plant their prayer flags onto the sacred grounds as a symbol of good luck. Mani stones, stone plates, rocks or pebbles inscribed with mantra or ashtamangala (a sacred suite of Eight Auspicious Signs), are a form of prayer in Tibetan Buddhism. Mani stones are intentionally placed along the roadsides and rivers or placed together to form mounds or cairns as an offering to local spirits (genius loci). Creating and carving mani stones is a traditional devotional practice. The prayer wheel is widely seen among Tibetan people. A wheel made from metal, wood, leather, or even coarse cotton, depicting or encapsulating prayers, mantras and symbols, is spun on a spindle. According to the Tibetan Buddhist tradition, spinning such a wheel several times in a clockwise direction will have much the same effect as orally reciting the prayers. In order not to desecrate religious artifacts such as stupas, mani stones, and gompas, Tibetan Buddhists walk around them in a clockwise direction, although the reverse direction is true for Bön. Tibetan Buddhists chant the prayer Om mani padme hum, while the practitioners of Bön chant Om matri muye sale du. Islam and Catholicism also have a few followers in Lhasa and Yanjing respectively. Tibetan Muslims are also known as the Kache. An elderly Tibetan woman with a prayer wheel. Three monks chanting in Lhasa, 1993. Ladakh landscape is full of chörtens (stupas). A prayer wheel with chorten in background. Young monks at Drepung Monastery. Tibetan festivals such as Losar, Shoton, Linka (festival), and the Bathing Festival are deeply rooted in indigenous religion and also embody foreign influences. Each person takes part in the Bathing Festival three times: at birth, at marriage, and at death. It is traditionally believed that people should not bathe casually, but only on the most important occasions. Losar, the Tibetan New Year, observed from the first to the third day of the first Tibetan month, is the most important festival in Tibet. Preparations for the New Year include making special offerings to family shrine deities and painting doors with religious symbols. On New Year's Eve families gather to eat guthuk, a soup with balls of barley paste that contain various fillings to signify the fortune of the person who eats them. After dinner the family observes the Ceremony of Banishing Evil Spirits to purify their home. Monlam, the Great Prayer Festival, falls on the fourth to the eleventh day of the first Tibetan month. Established in 1049 by Tsong Khapa, the founder of the order of the Dalai Lama and the Panchen Lama, it is the grandest religious festival in Tibet. Religious dances are performed and thousands of monks gather to chant before the Jokhang Temple. Examinations in the form of sutra debates for the Geshe, the highest degree in Buddhist theology, are also held. The most important folk festival in Tibet is the Nakchu Horse Race Festival. A tent city is constructed by people gathering in the town of Nakchu, and thousands of herdsmen in their finest dress participate in horse races, archery and horsemanship contests. A Harvest Festival (Ongkor in Tibetan) is celebrated in farming villages when crops ripen, usually around August. People walk around their fields to thank the gods and deities for a good year's harvest, and singing, dancing, and horse racing take place. The Shoton Festival, also known as the Yoghurt Festival, begins on the thirtieth day of the sixth Tibetan month. The festival originated in the seventeenth century when pilgrims served yoghurt to the monks who stopped for their summer retreat. Later, Tibetan opera performances were added to the event to entertain monks in the monasteries. During the festival, giant Thangkas of the Buddha are unveiled in Drepung Monastery while Tibetan opera troupes perform at Norbulingka. The Bathing Festival starts on the twenty-seventh day of the seventh lunar month and lasts for one week when Venus appears in the sky. Tibetans bring food, set up tents along rivers and bathe themselves under the starlight. The holy bath was believed to heal all kinds of illnesses and wards off misfortune. Tibetan art is deeply religious in nature, from the exquisitely detailed statues found in gompas (monasteries) to wooden carvings and the intricate designs of the Thangka paintings. Tibetan art can be found in almost every object and every aspect of daily life. Thangka paintings, a syncretism of Indian scroll-painting with Nepalese and Kashmiri painting, appeared in Tibet around the 8th century. Rectangular and painted on cotton or linen, they usually depict traditional motifs including religious, astrological, and theological subjects, and sometimes the Mandala. To ensure that the image will not fade, organic and mineral pigments are added, and the painting is framed in colorful silk brocades. The Tibetan folk opera, known as Ache lhamo ("sister goddess" or "celestial sister") is a combination of dances, chants, and songs. The repertoire is drawn from Buddhist stories and Tibetan history. Tibetan opera was founded in the fourteenth century by Thangthong Gyalpo, a lama and a bridge builder. Gyalpo recruited seven girls and organized the first performance to raise funds for building bridges to facilitate transportation in Tibet. The tradition continued uninterrupted for nearly seven hundred years, and performances are held on various festive occasions such as the Lingka and Shoton festivals. The performance is usually a drama combining dances, chants, and songs, performed on a barren stage. Colorful masks are sometimes worn to identify a character, with red symbolizing a king and yellow indicating deities and lamas. The performance starts with purification of the stage and blessings. A narrator then sings a summary of the story, and the performance begins. Another ritual blessing is conducted at the end of the play. There are also many historical mythical epics written by high lamas about the reincarnation of a "chosen one" who will do great things. A unique feature of Tibetan architecture is that many of the houses and monasteries are built on elevated, sunny sites facing the south. They are often made from a mixture of rocks, wood, cement and earth. Little fuel is available for heating or lighting, so flat roofs are built to conserve heat, and multiple windows are constructed to let in sunlight. Walls are usually sloped inwards at 10 degrees as a precaution against frequent earthquakes in the mountainous area. Tibetan homes and buildings are white-washed on the outside, and beautifully decorated inside. Many noble families maintained town houses in Lhasa, the capital city, built of stone with stables and storehouses around three sides of a rectangular courtyard and a three-story mansion on the side facing the gate. Nomadic pastoralists live in tents of yak hair, rectangular in shape and ranging from 12 to 50 feet (3.5 to 15 m) in length. Standing at 117 meters in height and 360 meters in width, the Potala Palace is considered the most important example of Tibetan architecture. Formerly the residence of the Dalai Lama, it contains over a thousand rooms within thirteen stories and houses portraits of the past Dalai Lamas and statues of the Buddha. It is divided between the outer White Palace, which serves as the administrative quarters, and the inner Red Quarters, which houses the assembly hall of the Lamas, chapels, 10,000 shrines, and a vast library of Buddhist scriptures. Tibetan medicine is one of the oldest forms in the world, utilizing as many as two thousand types of plants, forty animal species, and fifty minerals. The renowned eighth century physician Yutok Yonten Gonpo, a key figure in its development, produced the Four Medical Tantras integrating material from the medical traditions of Persia, India, and China. The tantras contained a total of 156 chapters in the form of Thangkas (paintings) which tell about the archaic Tibetan medicine and the essential principles of medicine practiced in other places. Yutok Yonten Gonpo's descendant, Yuthok Sarma Yonten Gonpo (b. 1126), added a further 18 medical works to the tradition. One of his books includes paintings depicting the resetting of a broken bone. In addition, he compiled a set of anatomical pictures of internal organs. The cuisine of Tibet reflect the rich heritage of the country and people's adaptation to high altitude and religious culinary restrictions. The most important crop is barley. Dough made from barley flour, called tsampa, is the staple food of Tibet. This is either rolled into noodles or made into steamed dumplings called momos. Meat dishes are likely to be yak, goat, or mutton, often dried, or cooked into a spicy stew with potatoes. Mustard seed is cultivated in Tibet, and therefore features heavily in its cuisine. Yak yoghurt, butter and cheese are frequently eaten, and well-prepared yoghurt is considered something of a gourmet dish. Drinking butter tea, made with tea leaves, yak butter, and salt, is a regular part of Tibetan life. Before work, a Tibetan typically downs several bowlfuls of this tangy beverage, and it is always served to guests. Nomads are said to drink up to 40 cups of it a day. This tea is very warming because it contains fat from the yak butter. Tibetans are very conservative in their dress, and though some have taken to wearing Western clothes, traditional styles still abound. Men and women both wear long sleeves even in the hot summer months. Because of Tibet's cold weather, the men and women wear thick long dresses (chubas); women wear dark-colored wrap dresses over a blouse and men wear a shorter version with pants underneath. A colorfully striped, woven wool apron signals that a woman is married. The style of the clothing varies from region to region. 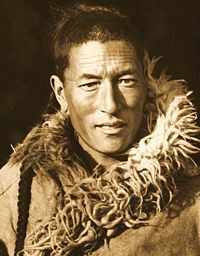 Nomads often wear thick sheepskin chubas. Most Tibetans wear their hair long, although in recent times some men have begun to crop their hair short. The women plait their hair into two or more queues, the girls into a single queue. A special coming-of-age ceremony is held when a girl is 17 years old, during which her hair is dressed in multiple plaits to indicate that she is now eligible for marriage. ↑ Unrepresented Nations and Peoples Organization - Tibet. Retrieved October 18, 2008. ↑ Travel China Guide, Tibet: People. Retrieved October 16, 2008. ↑ Dharamshala, Tibetan people. Retrieved October 15, 2008. ↑ The Government of Tibet in Exile, Population transfer and control. Retrieved October 18, 2008. ↑ War Statistics, Source List and Detailed Death Tolls for the Twentieth Century Hemoclysm. Retrieved October 16, 2008. ↑ United Nations Economic and Social Commission for Asia and the Pacific, Tibet: Population Situation. Retrieved October 16, 2008. ↑ Su, Bing, et al., "Y chromosome haplotypes reveal prehistorical migrations to the Himalayas," Human Genetics 107 (2000): 582–590. Retrieved October 15, 2008. ↑ R.A. Stein and J.E. Stapleton Driver (trans.) Tibetan Civilization (Stanford University Press, 1972), 28,46. ↑ Tibet Travel, Tibetan Language. Retrieved October 16, 2008. 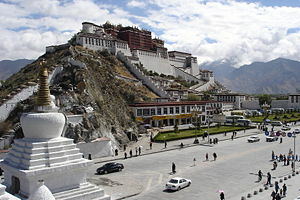 ↑ Travel China Guide Tibet. Retrieved October 16, 2008. ↑ Raju Barthakur, Winds of Change: Arunachalee in Tradition and Transition. Retrieved November 7, 2008. ↑ Col Ved Prakash, Encyclopaedia of North-east India, Vol 3 (Atlantic Publishers & Distributors, ISBN 8126907053). ↑ Tibet Travel, The Sherpas People. Retrieved October 16, 2008. ↑ Tibet Travel, The Deng People. Retrieved October 16, 2008. ↑ The Center for Research on Tibet, Tibetan Adaptation to High Altitude. Retrieved October 16, 2008. ↑ "Special Blood allows Tibetans to live the high life," New Scientist November 3, 2007: 19. ↑ Eurekalert, Elevated nitric oxide in blood is key to high altitude function for Tibetans. Retrieved October 16, 2008. ↑ China Travel Guide, Tibetan Festivals. Retrieved October 16, 2008. ↑ Bradley Mayhew and Michael Kohn, Tibet, 6th ed (2005, ISBN 1-74059-523-8). Barfield, Thomas J. The Nomadic Alternative. Englewood Cliffs, N.J.: Prentice Hall, 1993. ISBN 0136249825. Chorlton, Windsor, and Nik Wheeler. Cloud-Dwellers of the Himalayas: The Bhotia. Peoples of the Wild. Amsterdam: Time-Life Books, 1982. ISBN 0705407055. Goldstein, Melvyn C. and Cynthia M. Beall. Nomads of Western Tibet: The Survival of a Way of Life. Berkeley: University of California Press, 1990. ISBN 0520072103. Goldstein, Melvyn C. "Study of the Family structure in Tibet." Natural History. March 1987: 109-112. Jones, Schuyler. Tibetan Nomads: Environment, Pastoral Economy, and Material Culture. New York, NY: Thames and Hudson, 1996. ISBN 0500237204. Lopez, Donald S. Religions of Asia in Practice: An Anthology. Princeton readings in religions. Princeton, NJ: Princeton University Press, 2002. ISBN 0691090602. Mayhew, Bradley, and Michael Kohn. Tibet. Footscray, Vic: Lonely Planet, 2005. ISBN 1-74059-523-8. Stein, R.A., J.E. Stapleton Driver (trans.) Tibetan Civilization. Stanford University Press, 1972. ISBN 0804708061. Su, Bing, et al. "Y chromosome haplotypes reveal prehistorical migrations to the Himalayas." Human Genetics 107, 2000: 582–590. Retrieved October 18, 2008. Thargyal, Rinzin, and Toni Huber. Nomads of Eastern Tibet: Social Organization and Economy of a Pastoral Estate in the Kingdom of Dege. Brill's Tibetan studies library, v. 15. Leiden: Brill. 2007. ISBN 9789004158139. Travel China Guide: Article on modern Tibetan people. Imaging Everest: Article on Tibetan people at the time of early mountaineering. This page was last modified on 8 December 2015, at 22:16.